We are even getting much better optics from graphene. All welcome of course. Graphene is a continuing revolution and has also led to other elements been similarly mastered as well. It has made all materials science functionally obsolete and produced astonishing results as we investigate layer by layer fabrications. With the development of photonic chips and nano-optics, the old ground glass lenses can't keep up in the race toward miniaturization. In the search for a suitable replacement, a team from the Swinburne University of Technology has developed a graphene microlens one billionth of a meter thick that can take sharper images of objects the size of a single bacterium and opens the door to improved mobile phones, nanosatellites, and computers. One of the key obstacles in advances in optical microscopes is the lens or, more precisely, the diffraction limit, which is the theoretical limit of the resolution of a particular lens. There have been a number of attempts at overcoming the diffraction limit by using such techniques as interferometry, holography, lasers, and electrons, and although scientists have enjoyed some success, it has only been at great cost and complexity. 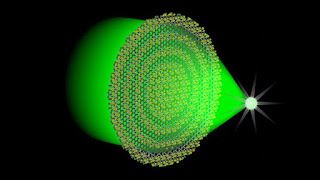 Another approach has been to explore the use of ultrathin flat lenses that are etched with concentric circles and act like tiny Fresnel lenses. According to the Swinburne team, this has also had some success, but only by crafting the lenses out of gold and other metals that don't lend themselves to mass production. Swinburne's breakthrough came when Xiaorui Zheng, a PhD student at the Centre for Micro-Photonics, used graphene oxide to form a lens. This material allowed the team to make ultrathin flat lenses that are 300 times thinner than a sheet of paper and weigh a microgram. This was achieved by effectively printing the lens, first spraying a sheet of graphene oxide solution, then molding the circles using a laser beam. According to the team, the new lens is flexible, can resolve objects as small as 200 nanometers, and can even see into the near infrared. This is possible a it breaks the diffraction limit and allows a focus of less than half the wavelength of light. Once the technology is mature, the team sees it as having applications beyond microscopy, such as in lighter, thinner mobile phones with thermal imaging capabilities, smaller endoscopes for surgery, as a replacement for conventional lenses in nanosatellites to save a couple of hundred grams of launch weight, and to increase the efficiency of photonic chips in supercomputers and superfast broadband distribution. The graphene microlens research was published in Nature Communications.